Katherine Freund, Founder and CEO, ITNAmerica, is the Project Manager for the ITNEverywhere Demonstration. Chrisophia Somerfeldt, Way2Go, is the local ITNE Project Manager. Chrisophia is working with the Steering Committee to recruit a Working Group. The first Working Group meeting will be scheduled for the week of Jan 16, 2012. The revised project schedule can be downloaded below. Please contact Dwight Mengel with any questions. On April 21, 2011, Tompkins County and GADABOUT Transportation Services, Inc. entered into agreement with ITNAmerica to participate in the ITNEverywhere (ITNE) pilot project in 2011-12. The project was supervised by a local steering committee of County departments and local agencies under the auspices of the Coordinated Plan Committee. Wed., Aug. 18, 2010: Coordinated Plan Committee meeting, Library, conference call with ITNAmerica. Wed., Aug. 25, 2010: Special Coordinated Plan Committee meeting, ITN Everywhere Webinar. Wed., Sept. 15, 2010 Coordinated Plan Committee meeting, Library. Tues., Sept 21, 2010 Ithaca-Tompkins County Transportation Council Policy Committee meeting. Thurs., Oct. 15, 2010 ITNEverywhere Steering Committee Meeting, DSS, conference call with ITNAmerica. Tues., Nov. 9, 2010 ITNEverywhere Steering Committee Meeting, Old Jail, conference call with ITNAmerica. Thurs., Nov. 18, 2010 GADABOUT Board of Directors agree to GADABOUT as Sponsoring Agency. Mon., Nov. 29, 2010 Coordinated Plan Committee Meeting, Old Jail. Wed., Dec. 1, 2010 County Planning, Development, Environmnetal Quality Committee, Old Jail. Wed., Dec 8, 2010 County Health & Human Services Committee, Old Jail. Tues., Dec 21, 2010 Tompkins County Legislature, Court House, consider County resolution. Mon., Mar. 14, 2011 ITNE Steering Committee Meeting, Old Jail, conference call w/ITNAmerica. Mon., Apr. 11, 2011 ITNE Steering Committee Meeting, Old Jail. Thurs., Apr. 21, 2011 MOU between County, GADABOUT & ITNAmerica is executed. On Sept. 7, 2010, the Tompkins County Office for the Aging, Department of Social Services, Ithaca-Tompkins County Transportation Council and GADABOUT sent a joint letter of interest to ITNAmerica to come to agreement for our participation in the ITN Everywhere development program. ITN Everywhere is an innovative development program for develop grassroots community transportation services in rural and small urban areas. We are interested in its key elements of time banking of volunteer credits, self-financing personal transportation accounts, and emphasis on sustainability. The program will create incentives for ridesharing, support trip reservation logistics for volunteer driver services, and enable community agencies, groups and faith-based organizations to coordinate their use of vans to serve local mobility needs. The business model enables information technology (software), marketing, fundraising, legal research and operations to be supported by ITNAmerica in Portland, ME. The overall approach is innovative and leverages advantages of a local grassroots network, internet access, a national network and a central hub for services, support and business development. We look forward to this development process. New York’s older population is growing rapidly, and by the year 2015 adults age sixty and over will make up 20 to 29 percent of the general population. This cohort will become 50% larger than the existing senior adult population. This major population shift presents a challenge to communities, government agencies, providers of housing and senior services, and others involved with older adults. Older adults express an overwhelming desire to live independently as long as possible. In most communities, maintaining mobility with alternatives to the personal automobile is critical to maintaining an independent lifestyle. People with disabilities may also have difficulty traveling, and public transport is not always sufficient to meet their needs. Everyone in the community will benefit from more options and increased safety. An increasing number of Americans are aware of the environmental impact of driving, and are seeking opportunities to reduce their carbon footprint. 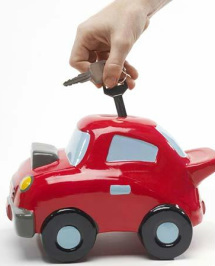 For others, the costs of solely owning and operating a car consume a disproportionate share of household income. To meet the evolving transportation needs of communities across New York State, ITNAmerica through the Harry and Jeannette Weinberg Foundation will provide 4 communities $25,000 each in matching funds to establish and incubate pilot sites of ITNEverywhere ® — a research and development project designed to test how elements of a proven alternative transportation model (the ITN ® affiliate model) may be used to serve smaller communities. The project will also study how to incorporate some additional innovative transport methods (currently outside the ITN model) which show promise in smaller communities. 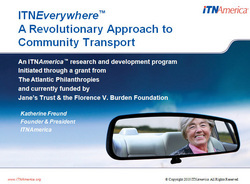 ITNEverywhere takes the core business innovations of the original ITN model for seniors—personal transportation accounts, and a flexible approach to private resources, including traded vehicles, volunteer credits, cash, co-payments, and gift certificates—and expands them to include the population as a whole in conjunction with a suite of software programs designed to document, track and access multiple forms of unused private capacity. To learn more about this exciting new opportunity, please download the entire text of the announcement here. ITNAmerica Press Release, New York Communities consider benefits of ITNAmerica, ITNEverywhere, 8/31/2010. "Just as Independent Transportation Network ® (ITN) unites older people with their communities, ITNAmerica unites communities across the country. Our proprietary ITNRides software system enables us to leverage our expertise and to simplify operations for all our affiliates. It connects every ITN affiliate community into one effective centralized national network that manages the logistics of the senior transportation service, including member and volunteer management and ride scheduling. All ITN affiliates access the software through an internet connection and store their information at our secure data center. The collected data is used for a variety of purposes; including helping social researchers better understand senior mobility and its effects on society. ITN technology provides everything needed to deliver logistical efficiency to a very complex problem. And with dozens of affiliates expected by 2011, ITN is quickly linking cities and citizens across the country. And that's just the beginning.